Members were given one of these at the start of the year. We are to look after it and bring it back at the December 2017 meeting (the annual Pot Luck) for comparison. Common Names: Kudu Lily, Star of Lundi. 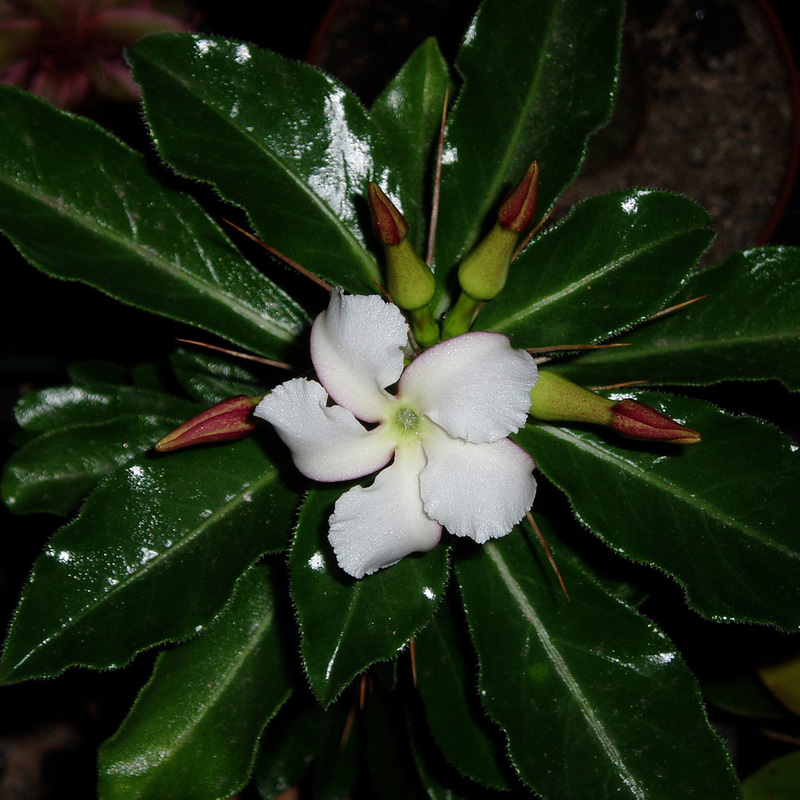 It is technically a subspecies of P. lealii as it occurs in a distinctly separate geographic area from the other (nominate) subspecies P. lealii lealii, although it may be argued that it is a variety as it has sufficiently different characteristics. The subspecies saundersii grows only to 1.5m (5 ft), whereas lealii is much taller, up to 8m (26 ft), and is native to Namibia over 1000km (620 miles) away on the west coast. 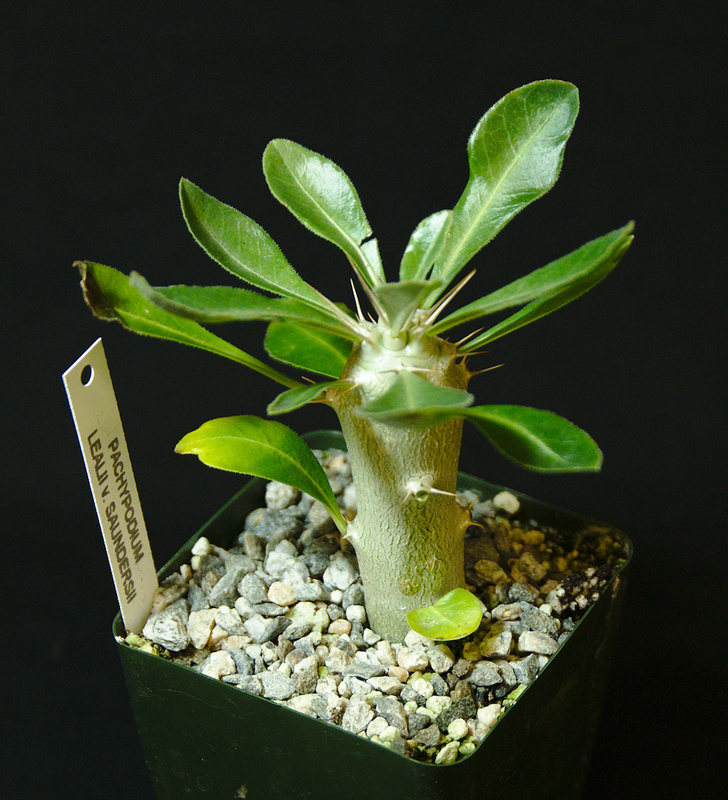 GENUS: Pachypodium [pak-uh-PO-dee-um] Thick foot. SPECIES: lealii [lay-AH-lee-eye] Named for the 19th century Portuguese geologist Fernando da Costa Leal, who described the Bottle tree while in Angola. SUBSPECIES: saundersii [son-DER-see-eye] Named for the botanist Sir Charles Saunders who discovered it in South Africa in the late 1800s. Officially described in 1892 by N. E. Brown, a famous KEW botanist. Endemic only to the Lebombo mountains near the east coast of Southern Africa, in the countries of South Africa, Swaziland, Mozambique, and Zimbabwe. The Lebombo, just to the south and west of Kruger National Park, are a relatively low range of mountains, max. 776m (~2500 ft) consisting of volcanic rock, sandstone, and granite. The plant grows in dry woodland in rocky terrain in crevices. The mountains run from Hluhluwe in the Zulu-Natal province of South Africa, north through Swaziland, to the Limpopo region of South Africa. Running through areas with fascinating names, like Mhlekazi, Mbabane, and the Hhohho region. 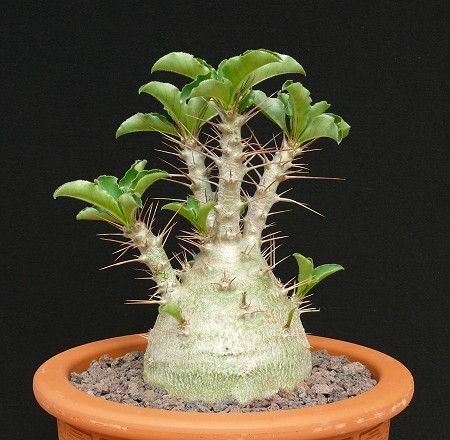 Pachypodium have a habit of living on rocky outcrops, steep hillsides, and inselbergs, which raise them above any surrounding flora and create micro-climates that may be different from the general climate of that region. As a result they are subjected to fluctuating moisture, high winds, and extremes in temperatures. They prefer sunny, xeric conditions, and often live in rock fissures with only small amounts of poor soil. To survive such conditions they store water in their trunks to last through periods of extreme drought. In addition they possess spines to catch moisture in fogs and dews, these spines direct the moisture towards the roots. The flowers are white, waxy, and tinged purple-pink, pollinated by moths, resembling those of Plumeria. The bloom period is from February to May, but may only bloom after the plant is several years old. The stem is bottle shaped, often wider than it is tall, growing to 1.5m (5 ft) in diameter. It becomes papery and tears with age. Branches appear above the main stem and are covered with thick spines. Leaves appear all along the branches being light green, smooth, and somewhat shiny with a white midriff. 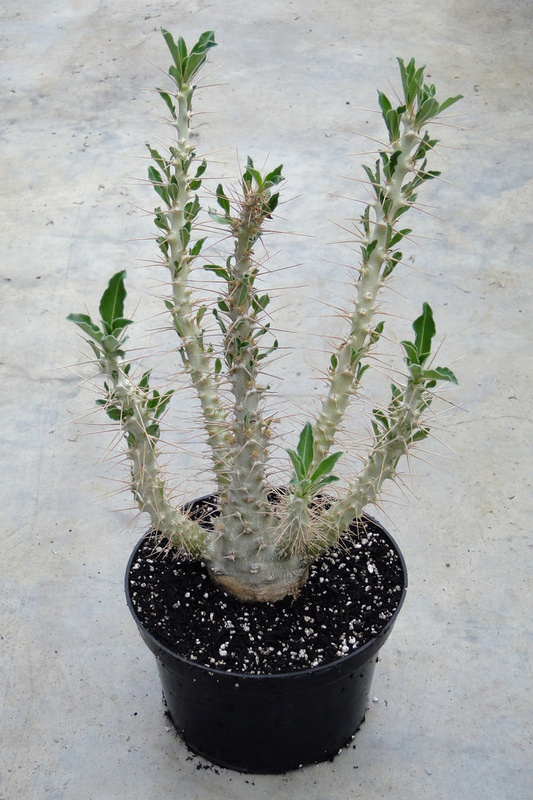 It is considered to be one of the easiest pachypodium to grow in cultivation as it is a rapid grower and tolerates lower temperatures. However it is important to keep it dry in the cooler winter months to avoid rot. It will do best in bright light, avoiding moist shady situations. At temperatures below 50F the plant becomes dormant, and can be damaged at temperatures below 30F. It requires a very well draining medium. In natural habitat it grows in rocky fissures with it’s roots reaching down to soil below. Some growers use plenty of pumice, perlite, or volcanic rock around the base of the plant, with regular growing media lower down. Requires water in Summer months, which is it’s native rainy season (back in the southern hemisphere), none to little water in the Winter. These plants do well when cramped – don’t over-pot. Growing them “hard” will produce fat, compact growth. Let them go dry between watering, but not bone dry. All Pachypodiums like light frequent feedings to maintain good growth. When plants are coming out of dormancy be careful not to over water too quickly. Leaves will grow before roots start growing. Wait a week or two to resume watering. They do not root readily from cuttings. To propagate them from seed bury seeds about 1/8 inch deep in well-drained soil. Keep damp until germination. Seeds should germinate in 3 to 12 days. Wait at least a year before transplanting into individual pots.